How cute is this dress from Shabby Apple? This is the Sao Paulo dress. 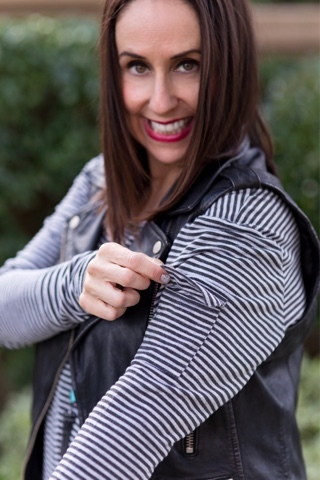 I love the gray and white stripes and the hidden pocket on the sleeve. When I received this dress it was a bit big and long. I washed it and tumble dried it on low and then it fit perfectly. I decided to pair it with a fun faux leather vest, my black converse tennis shoes, and this Kendra Scott necklace. This Shabby Apple dress was not only the most adorable, but also comfortable outfit for running around town doing errands. As a mom, there are days when I am so busy doing so many different things like the going to the cleaners, the market, picking up supplies for the kids and driving driving and more driving. This Shabby Apple dress was the perfect choice for my busy schedule. I've partnered up with Shabby Apple to host a giveaway for a $50 gift card to shop on their site. You must check it out-- they have the cutest clothing for affordable prices. To enter you must follow @shabbyapple and @everythingevelyne (and like the Shabby Apple dress picture) on Instagram. Then tag your BFF in the comments section. That's it!! It's that simple!! One entry per household and no giveaway accounts. You can enter once a day to give yourself better chances. You can also earn one extra entry by following my blog Everything Evelyne on Bloglovin. Contest ends February 3 at 12am PST. Good luck. Thanks to Gabi Wells for photos and happy reading.